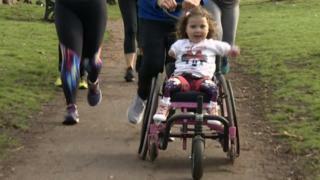 A girl who lost all her limbs after contracting meningitis is to take part in a half-marathon by being pushed round the course in a wheelchair. Harmonie-Rose Allen, 5, from Bath will be pushed by a team of volunteers in the event in Bath next month. As a baby in 2014 she contracted meningococcal septicaemia and was given a 10% chance of survival. She said it felt "really good" and was "fun" when she was being pushed along in preparation for the event. A team of seven runners, including her aunt Hannah Hall and two of her teachers, will take turns to push her. In doing so, they will raise money for local charity Time is Precious, which provided toys to Bristol Children's Hospital, where Harmonie-Rose was treated after she became ill. Her mother, Freya Hall, said her daughter was looking forward to the race. "She can't wait to be running with her aunt Hannah and the whole team. She's so excited," she said. It is believed Harmonie-Rose will become the youngest ever participant to complete the annual 13.1 mile (21 km) race.